512 pages | 12 B/W Illus. The politics of the internet has entered the social science mainstream. From debates about its impact on parties and election campaigns following momentous presidential contests in the United States, to concerns over international security, privacy and surveillance in the post-9/11, post-7/7 environment; from the rise of blogging as a threat to the traditional model of journalism, to controversies at the international level over how and if the internet should be governed by an entity such as the United Nations; from the new repertoires of collective action open to citizens, to the massive programs of public management reform taking place in the name of e-government, internet politics and policy are continually in the headlines. 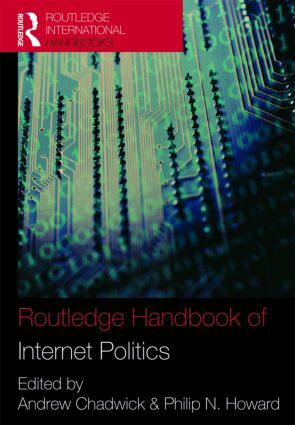 The Routledge Handbook of Internet Politics is a collection of over thirty chapters dealing with the most significant scholarly debates in this rapidly growing field of study. Organized in four broad sections: Institutions, Behavior, Identities, and Law and Policy, the Handbook summarizes and criticizes contemporary debates while pointing out new departures. A comprehensive set of resources, it provides linkages to established theories of media and politics, political communication, governance, deliberative democracy and social movements, all within an interdisciplinary context. The contributors form a strong international cast of established and junior scholars. This is the first publication of its kind in this field; a helpful companion to students and scholars of politics, international relations, communication studies and sociology. Andrew Chadwick is Professor of Political Science and Founding Director of the New Political Communication Unit at Royal Holloway, University of London. He is the author of Internet Politics: States, Citizens, and New Communication Technologies (Oxford University Press), which won the American Sociological Association Communication and Information Technologies Section Outstanding Book Award. Philip N. Howard is Associate Professor in the Department of Communication at the University of Washington, and directs the World Information Access Project (www.wiareport.org). He is the author of New Media Campaigns and the Managed Citizen (Cambridge University Press), which won book awards from the American Sociological Association and the International Communication Association.